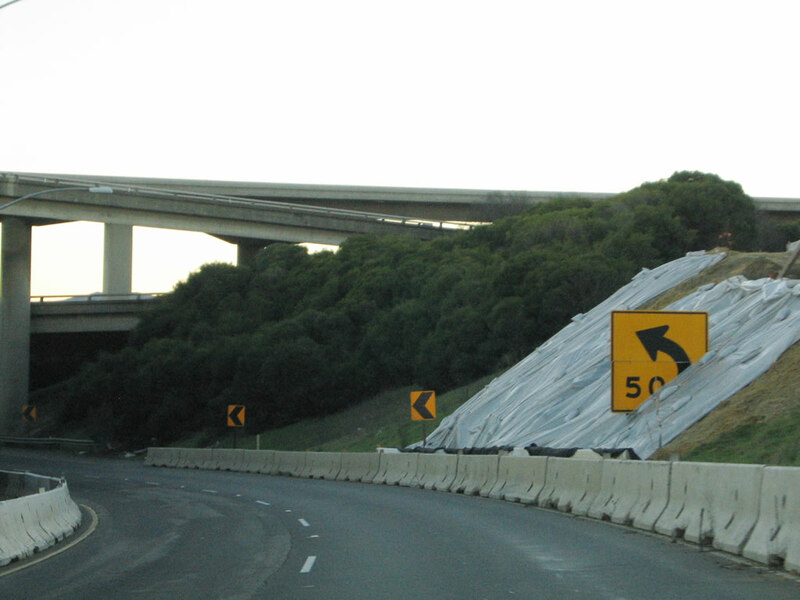 This is the first shield along Interstate 680/Gibson Freeway south after the freeway splits off from Interstate 80 and California 12 near Cordelia. Photo taken 11/28/04. 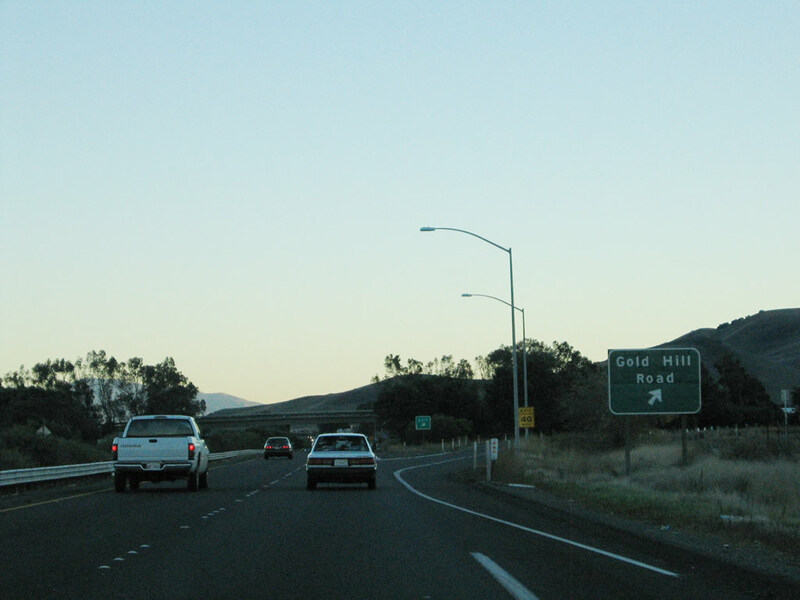 The first exit along Interstate 680/Gibson Freeway south is Exit 68, Gold Hill Road. Photo taken 11/28/04. Southbound Interstate 680 reaches Exit 68, Gold Hill Road. Photo taken 11/28/04. 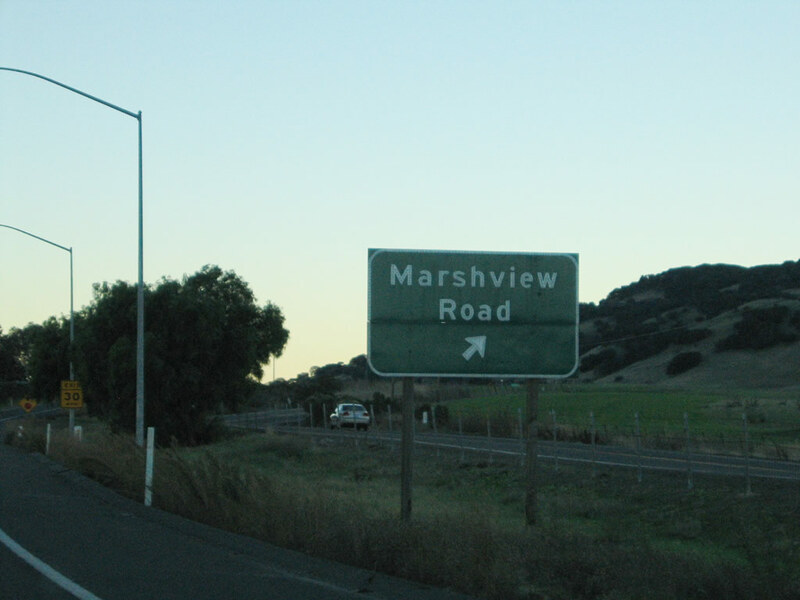 The next exit along Interstate 680 south is Exit 65, Marshview Road. This interchange merely serves to connect the frontage roads on either side of Interstate 680 (Lopes Road on the west side and Goodyear Road on the east side). Photo taken 11/28/04. 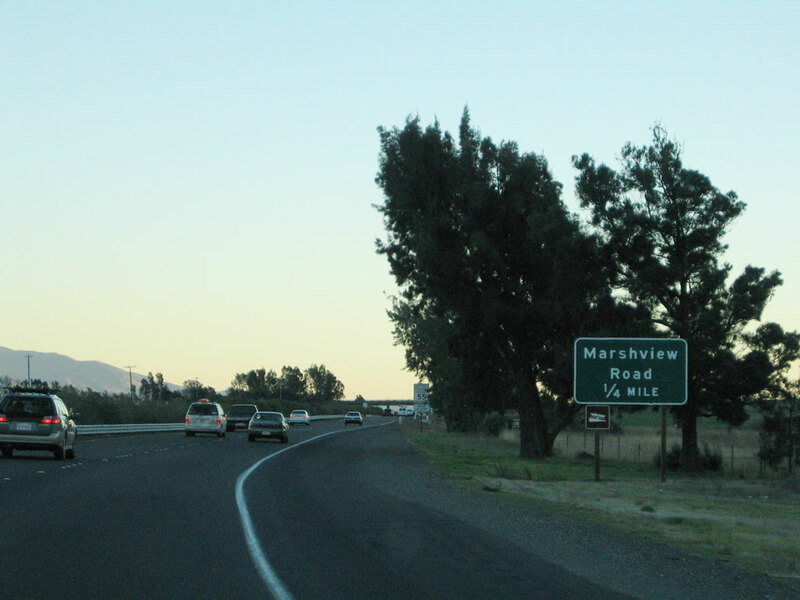 Southbound Interstate 680 reaches Exit 65, Marshview Road. Photo taken 11/28/04. 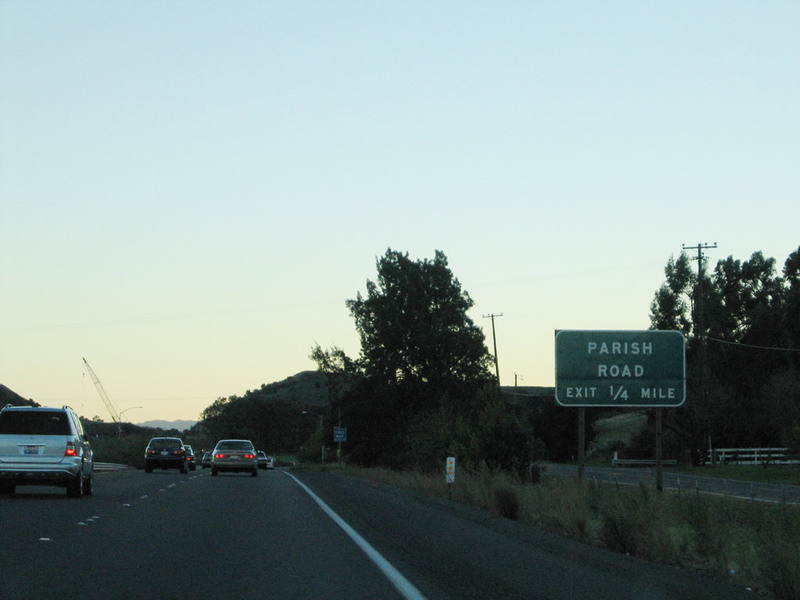 The next exit along Interstate 680 south is Exit 63, Parish Road. Note the all-capital letter font used on this approach sign. Photo taken 11/28/04. Southbound Interstate 680 reaches Exit 63, Parish Road. Like Marshview Road, Parish Road only serves to connect the frontage roads that straddle Interstate 680. Photo taken 11/28/04. 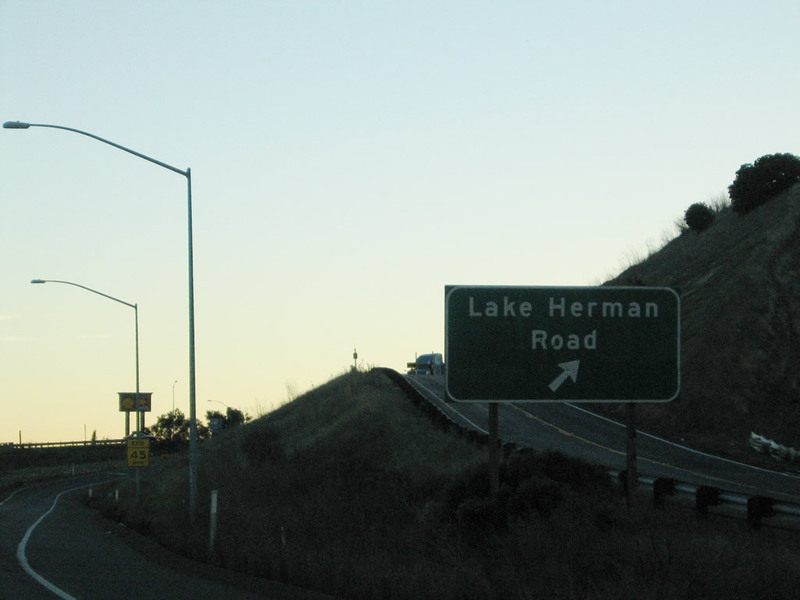 Shortly thereafter, southbound Interstate 680 reaches Exit 61, Lake Herman Road. 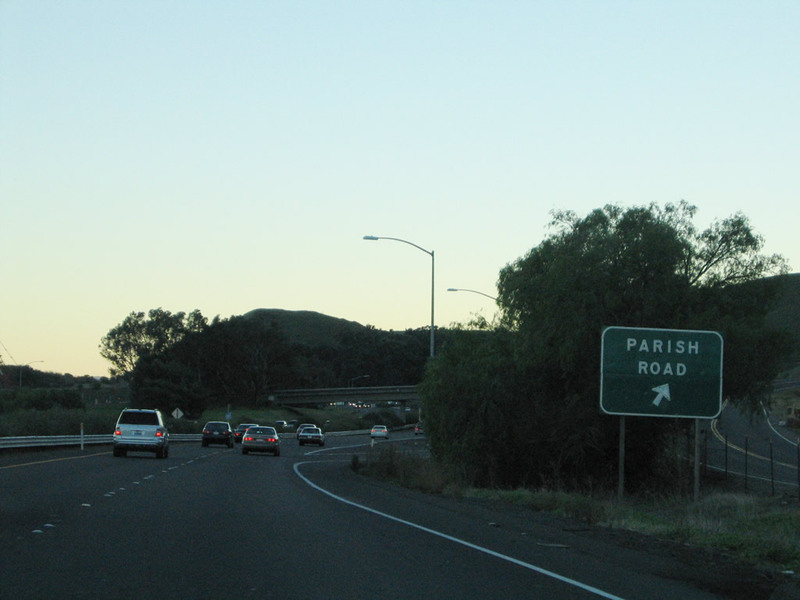 In this area, Interstate 680 enters the city of Benicia, which is home to 26,865 people as of the 2000 Census and was founded on May 19, 1847. The city briefly served as the capital of the state of California, from February 11, 1853 through February 25, 1854 until the capital was permanently moved to Sacramento. Photo taken 11/28/04. The next exit along Interstate 680/Gibson Freeway south is Exit 60, Industrial Way to Bayshore Road and Park Road, including the Valero oil refinery. Photo taken 11/28/04. 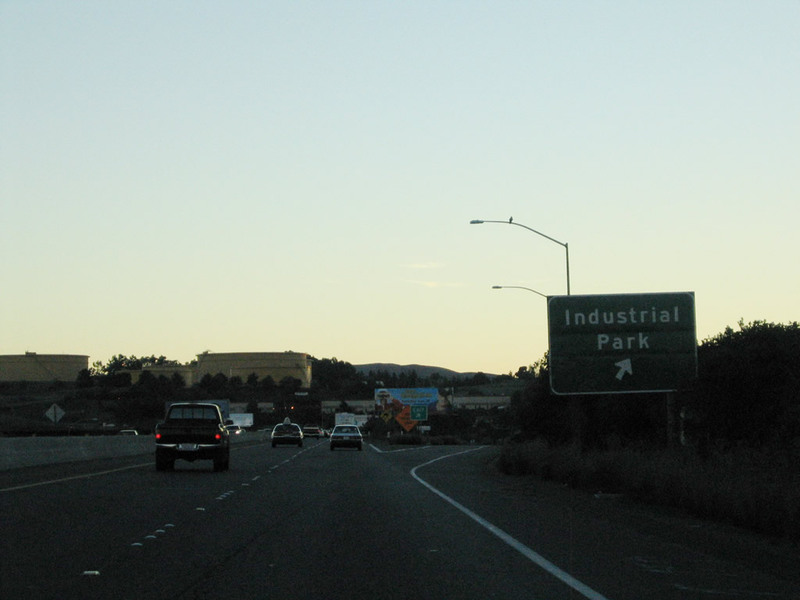 Southbound Interstate 680/Gibson Freeway reaches Exit 60, Industrial Park. Photo taken 11/28/04. 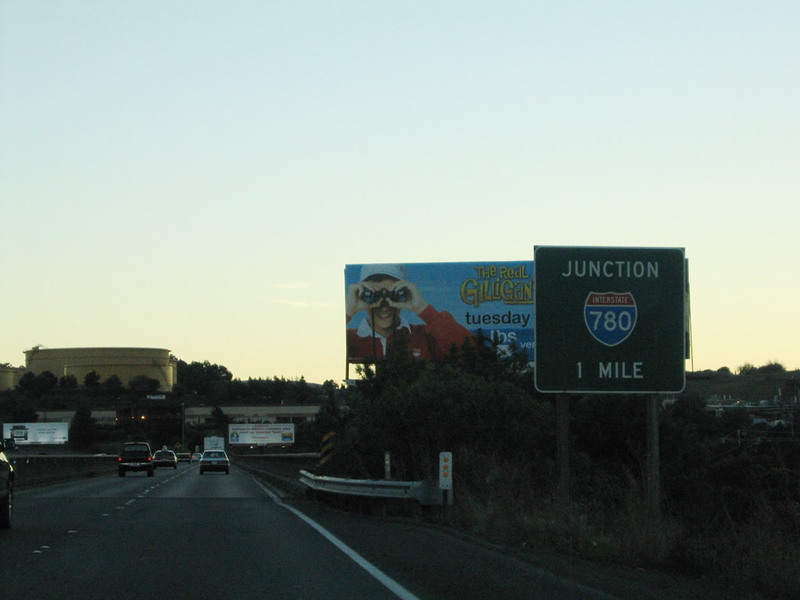 Many of the guide signs along southbound Interstate 680 between Interstate 80 and Interstate 780 are roadside signs (not overhead), including the first sign for westbound Interstate 780 (Exit 58), one mile. Photo taken 11/28/04. 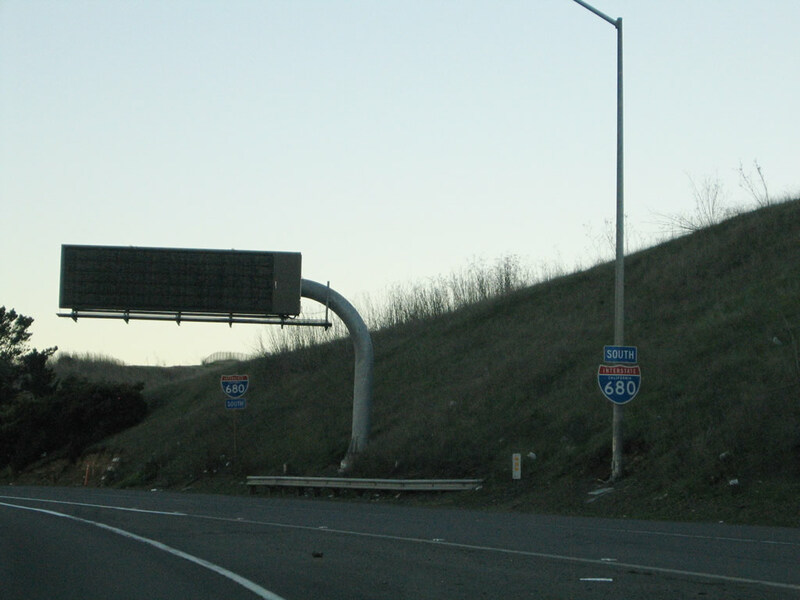 Two reassurance shields for Interstate 680 south are posted after the Bayshore Road on-ramp. 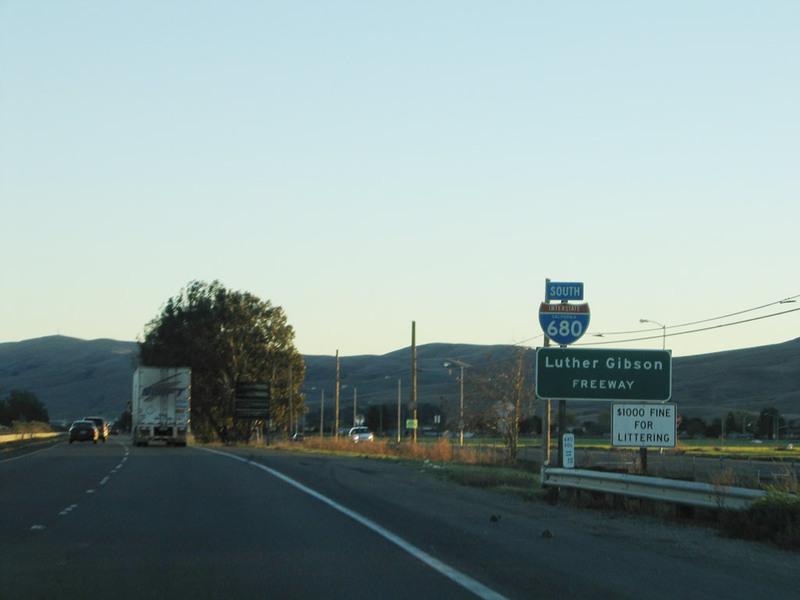 The Interstate 780 interchange (Exit 58) is just ahead. Photo taken 11/28/04. Southbound Interstate 680 approaches Exit 58, Interstate 780, next right. 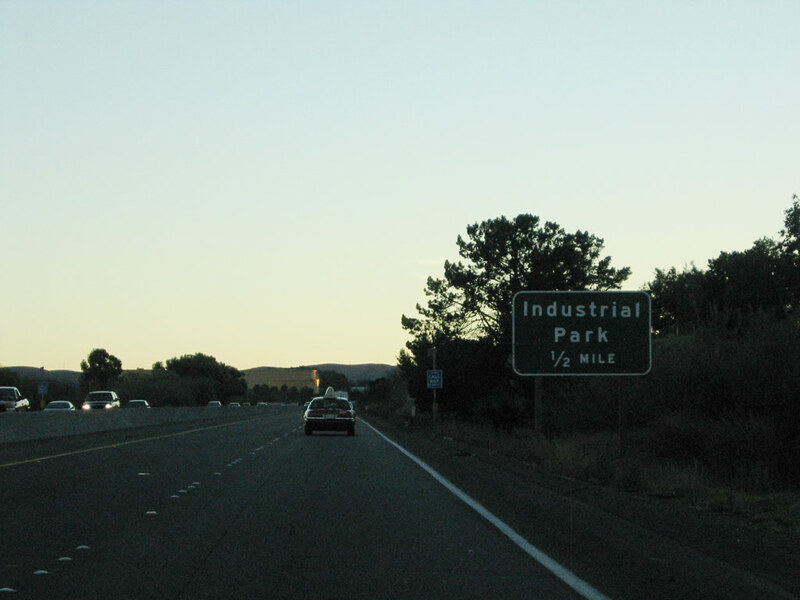 Prior to 1976, Interstate 780 was part of Interstate 680, and the section of Interstate 680 north of Benicia was part of California 21. Photo taken 11/28/04. 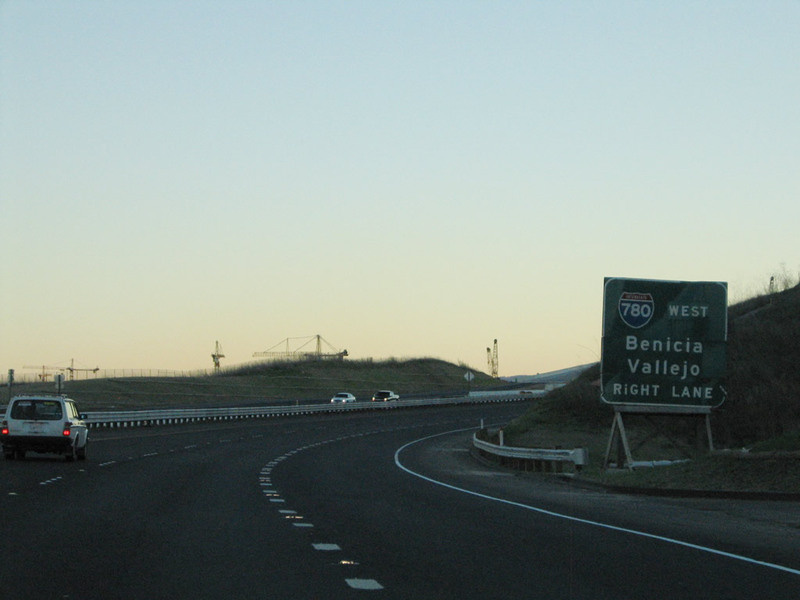 Southbound Interstate 680 reaches Exit 58, Interstate 780 west to Vallejo. This overhead sign assembly has been removed, and a new exit number overhead is now in place (photo forthcoming). 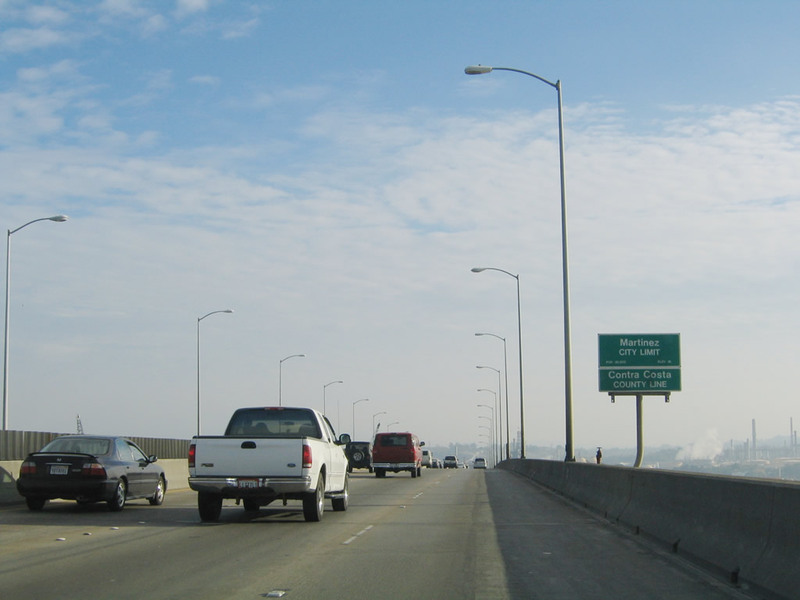 The Benicia-Martinez Bridge (which crosses the Sacramento River Delta) is located after this interchange, but there is no toll along southbound. Photo taken 08/24/03. 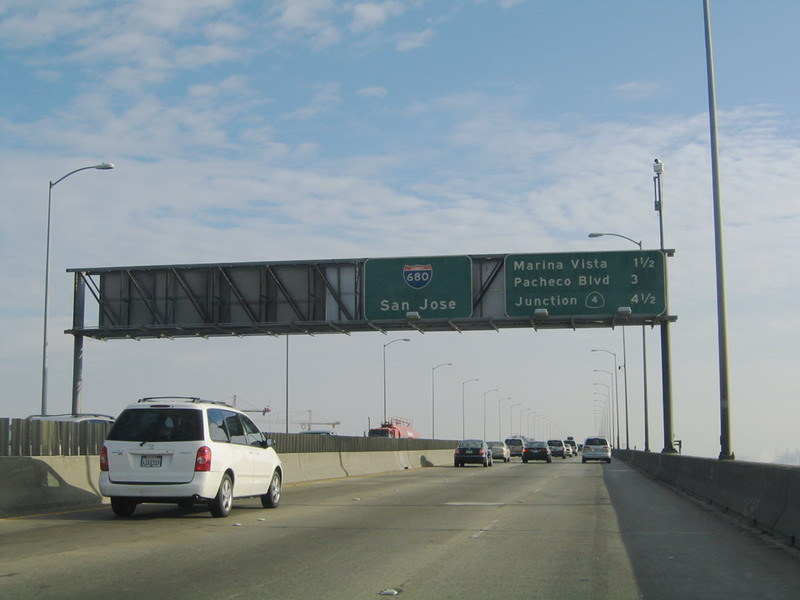 After the Interstate 780 split, southbound Interstate 680 passes through a tri-level stack created by the northbound Interstate 680 ramp to Interstate 780 west and the ramp from Interstate 780 east to Interstate 680 north. 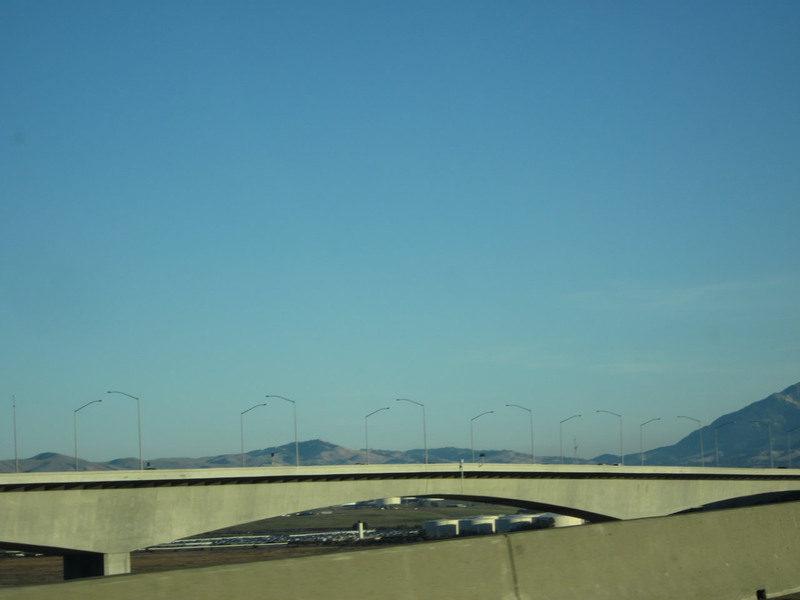 After this brief interchange, Interstate 680 south crosses the Benicia-Martinez Bridge. This bridge was expanded in August 2007 to include a new northbound span, thus doubling the capacity of the bridge. Photo taken 11/28/04. The original Benicia-Martinez Bridge was opened to traffic on September 15, 1962 (George Miller, Jr. Bridge, deck truss span, 1.2 miles); the new span opened on August 25, 2007 (segmented concrete span, George Miller III Bridge, 1.7 miles). 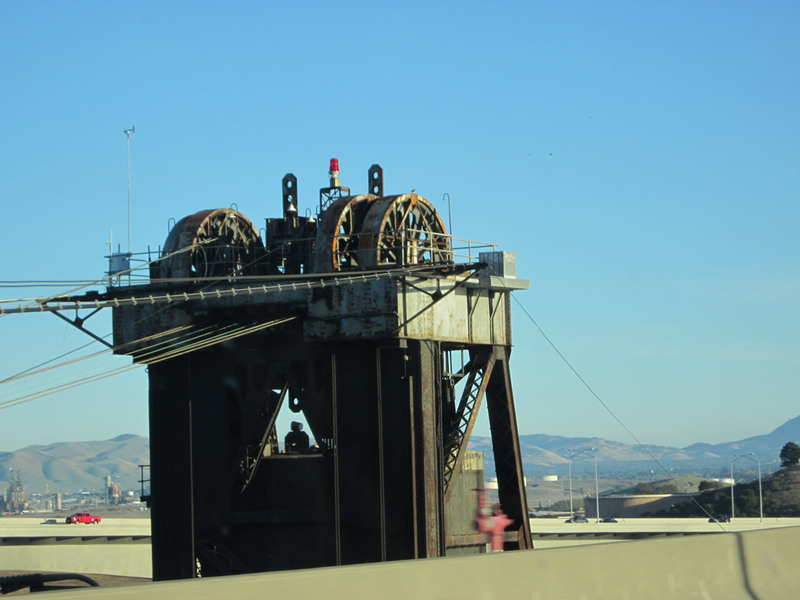 A Union Pacific railroad lift bridge sits between the two spans; it was built in 1929-1930. As part of a project to expand the Benicia-Martinez Bridge to include a new northbound span, this picture shows the massive bridge deck being installed. Pillars for the new bridge were being placed at the time this photo was taken. 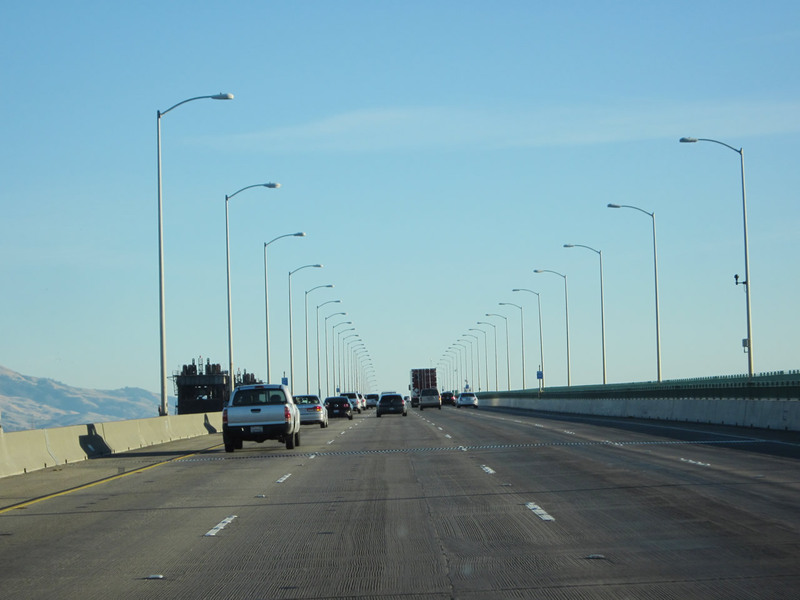 Upon completion, Interstate 680 over the delta was brought up to Interstate standards, including full shoulders. Traffic from Interstate 780 east merges onto Interstate 680 south from the right just as we begin to cross the bridge. Photos taken 11/21/12 and 12/29/04. 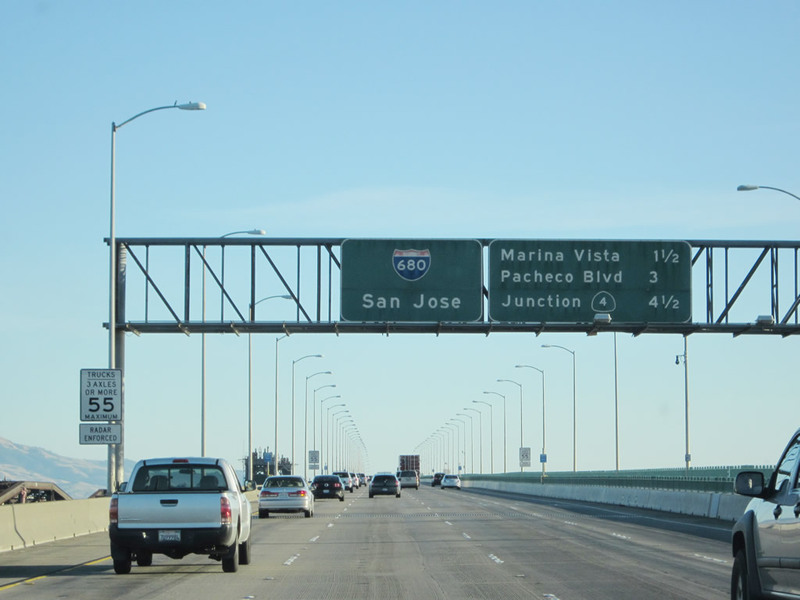 This mileage sign on the southbound lanes of the Benicia-Martinez Bridge provides the distance to the next three exits: Exit 56, Marina Vista; Exit 54, Arnold Road/Pacheco Boulevard; and Exit 53, California 4. 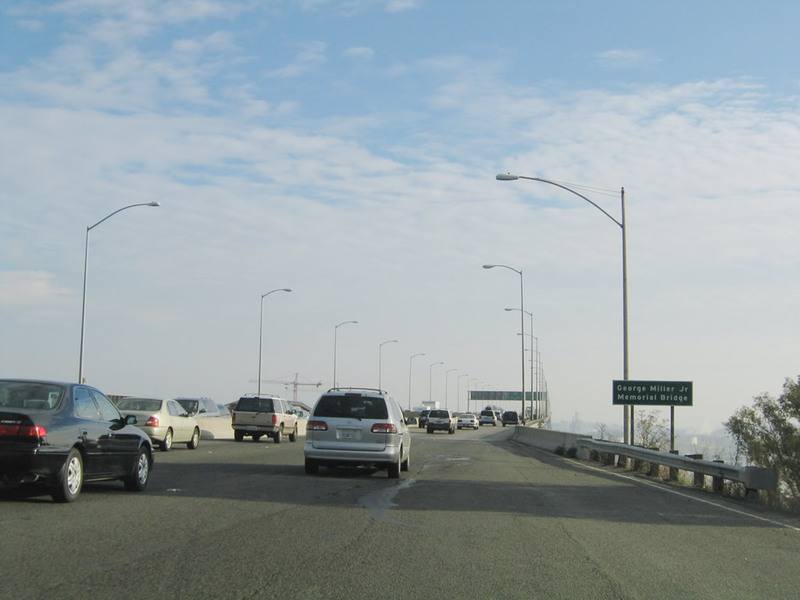 Once the new bridge for northbound traffic was built, the old bridge&apos;s northbound lanes became southbound lanes. As a result, the signs were shifted to the left on the already-existing sign bridge as shown here. Photos taken 11/21/12 and 12/29/04. 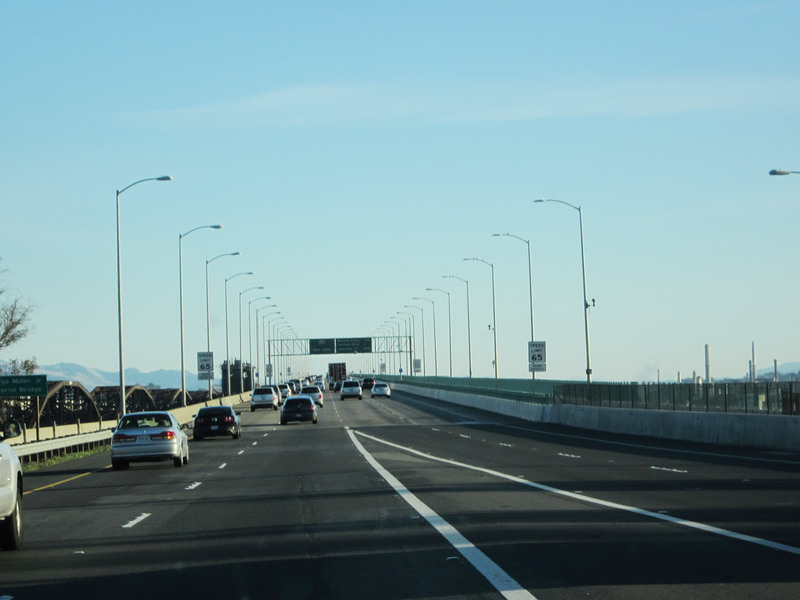 Continuing across the Sacramento-San Joaquin River Delta (Carquinez Straits), the southbound bridge retains four through lanes along with a barricade-separated walkway for pedestrians and bicyclists. The last two pictures show the northbound bridge as well as the top of one of the towers for the railroad lift bridge. Photos taken 11/21/12. 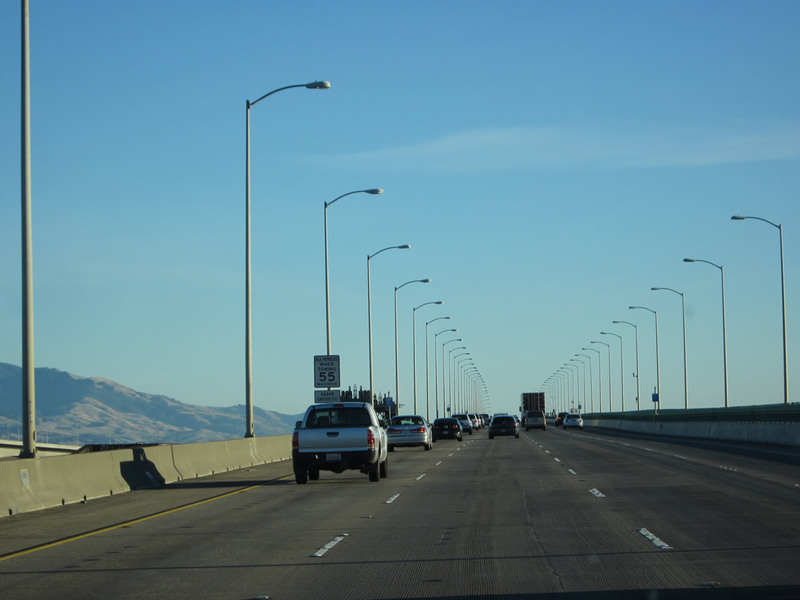 Interstate 680 leaves Solano County and enters Contra Costa County around midspan of the Benicia-Martinez Bridge. 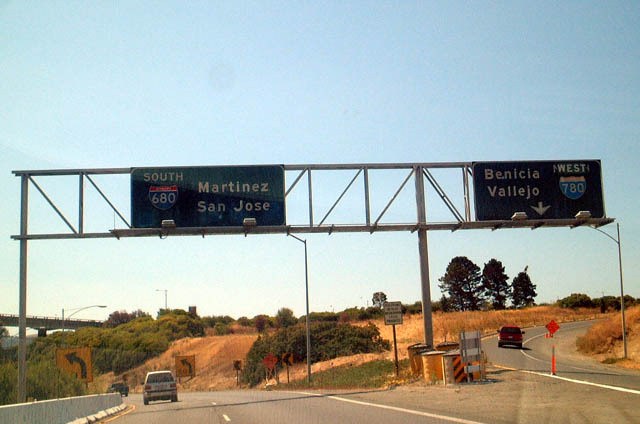 Additionally, Interstate 680 enters the city of Martinez, the seat of Contra Costa County. Founded in 1876, Martinez contains 12.5 square miles and is home to over 36,700 residents. 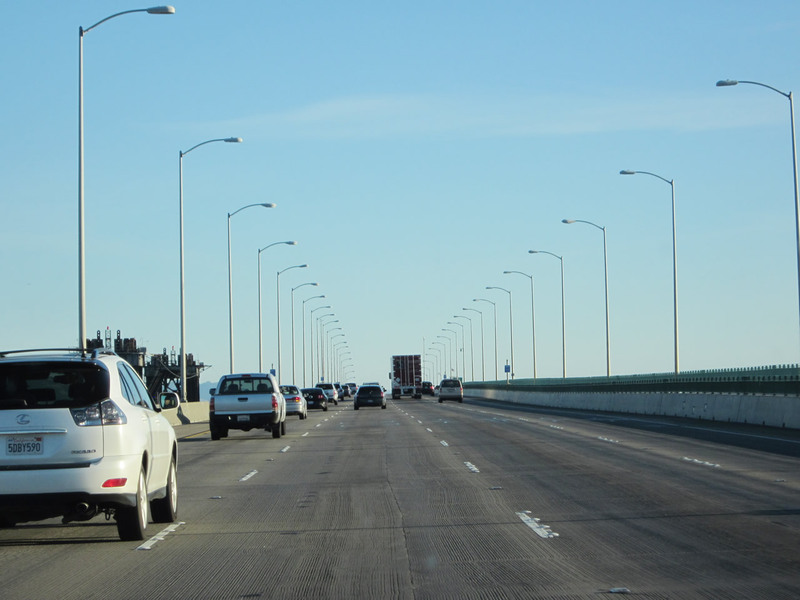 Interstate 680 skirts the city, only entering the city limits as it ends its journey across the Carquinez Strait/Suisun Bay via the Benicia-Martinez Bridge. Photo taken 12/29/04.